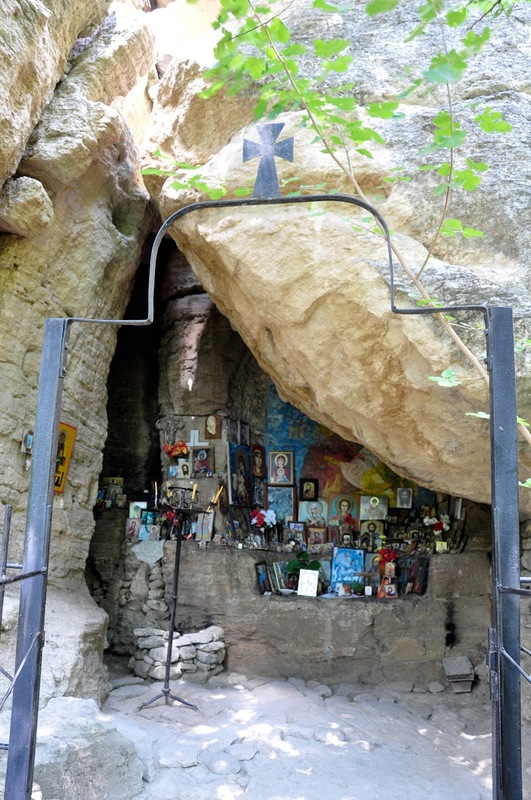 Visiting Madara was my favourite day out during my stay in Bulgaria this summer. Today I am going to tell you about this magical place, which had been home to many different civilizations – from cavemen to Thracians, Romans, Byzantines, Slavs and Bulgarians – during its centuries-long existence. 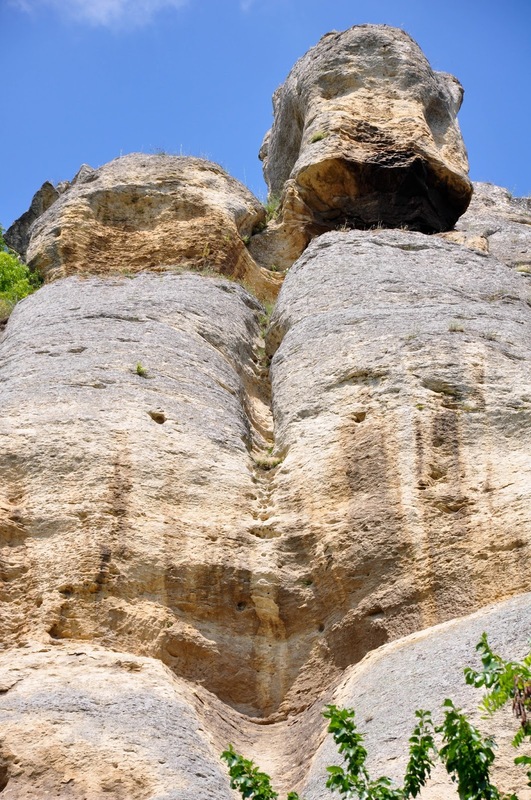 In Bulgaria Madara is ultimately famous as the location of the global symbol of the nation and the country – the Madara Horseman – a bas-relief carved in the face of a rock at 23 meters height above ground level. It represents a nobleman on his horse followed by his dog. At the feet of the horse lies a lion. Pierced by the spear of the nobleman the powerful animal twitches in death agony. 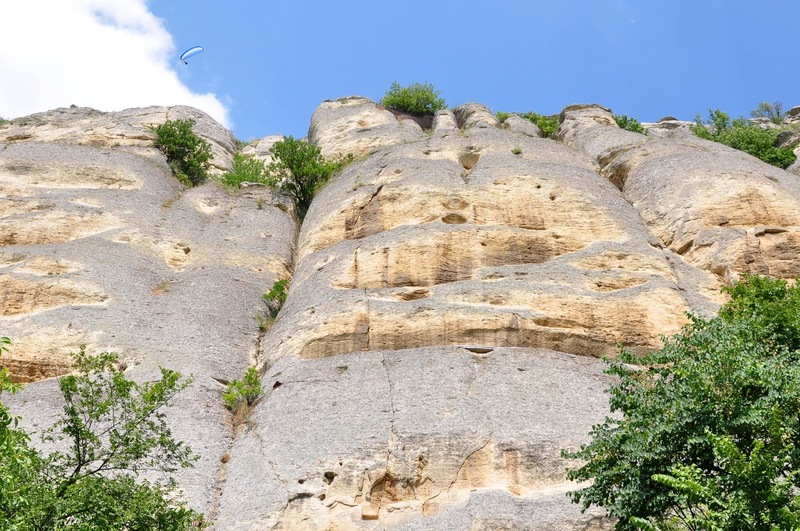 The composition is surrounded by texts, also carved into the almost 100 meters high vertical rock, marking seminal moments of the history of the First Bulgarian Empire. The Madara Horseman is so well-known in Bulgaria that Bulgarian coins have it minted on their reverse side. Known also as the ‘Madara Rider’ in English, since 1979 it forms part of UNESCO’s List of World Heritage Sites. The rock relief is also often the destination of countless school trips with children from all over the country arriving to marvel at it. I remember going on at least a couple such school trips during which we were shown the beauty and the heritage of Bulgaria so as not only to bring the history lessons we had been having into the real palpable world, but to excite us about our glorious historical past. As Madara is only just over an hour from my home town of Varna, where I spent two weeks this summer visiting my parents, I really wanted to re-visit the place, see the Horseman again and show it to my English husband. So, in the afternoon of a blindingly hot day and after an emotional visit to the excavations of the First Bulgarian Capital – Pliska – we headed to Madara driving through expansive fields of golden sunflowers. A quarter of an hour later, we pulled into a parking lot surrounded by little coffee shops and small restaurants. 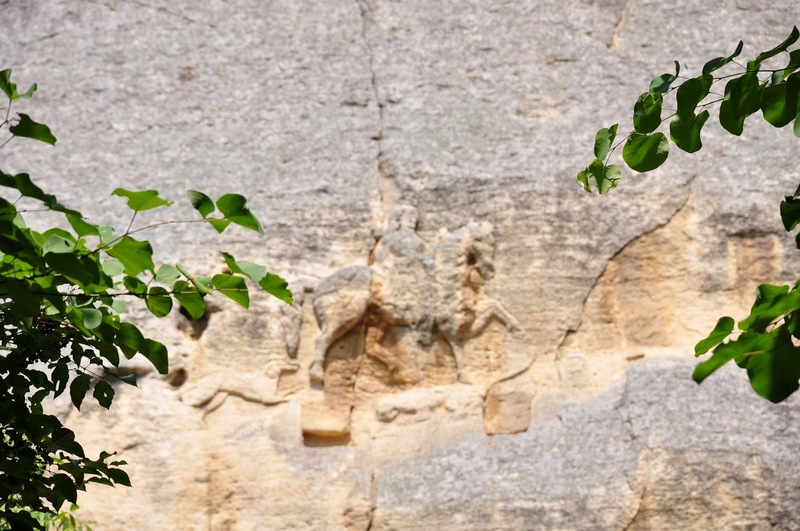 Right in front of us stood the tall and rugged cliffs into which surface the Horseman has been carved between the very late 7th century and the very early 8th century. Tall leafy trees were densely covering the steep slopes. It was quiet and peaceful and even though the parking lot was full with cars, the air was free of the stress which is so palpable around crowded tourist attractions. In fact, Madara seemed to have a lovely energy to it. The smiley lady in the ticket office gladly explained what we could see, then pointed us to the paths to follow. You see, as a centre of several preceding civilizations Madara is a National Historical and Archaeological Reserve where you can visit a rock sanctuary, a rock tomb, a museum, several caves, a rock monastery, the ruins of a Roman villa, the remains of a fortress, Old Bulgarian baths, the ruins of an Early Christian Basilica and many other sites of historical and cultural interest, the indisputable highlight of which is the Madara Horseman. You can easily spend a whole day or even two there exploring. 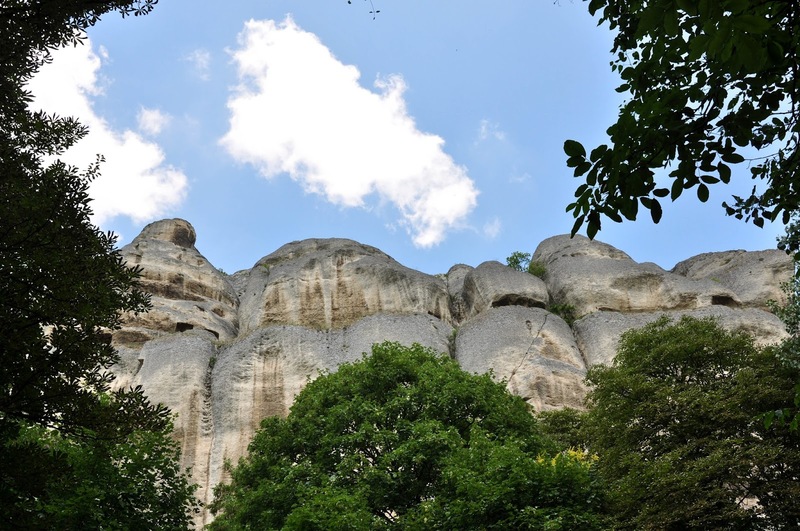 Just imagine these most whimsically shaped cliffs jutting vertically up to the blue sky with slopes half bare and half covered with dense forests among which you come across vestiges of times long gone by. You go up this way and large caves are revealed in front of your amazed eyes, you go down that way, and the ruins of an Old Bulgarian worship site appear right next to you. It truly is a one of a kind place. 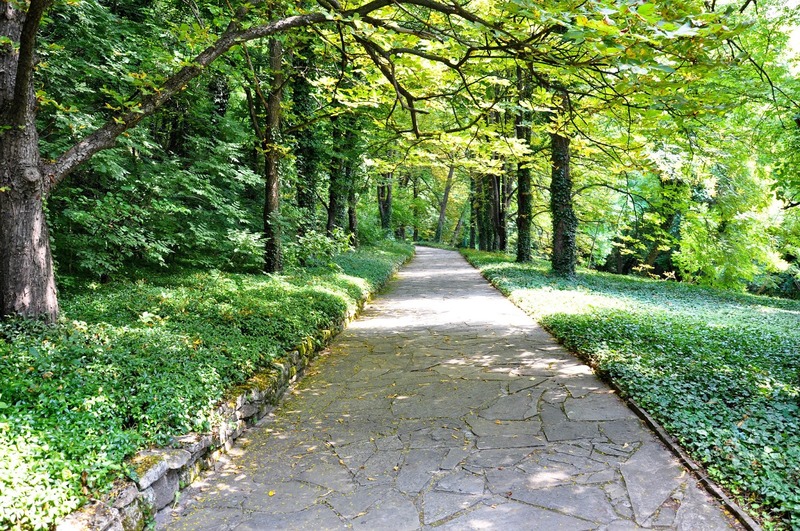 We only had an afternoon at our disposal, though, so eager to see as much as we could, we started on the sloping path. 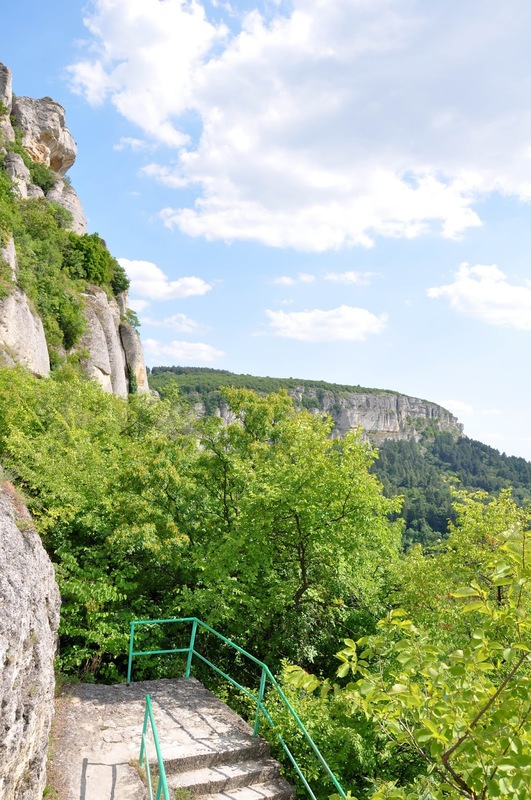 You see, there are two possible paths to follow – one made entirely of stairs going steeply up all the way to the Horseman on the face of the cliffs. The other was much easier to navigate, as it sloped gently up the cliffs among the tall trees. It was also covered with flat stone slabs and it was dotted with benches, so, obviously, not wanting to exert ourselves too much we started on it. It was very beautiful. Wild birds were fluttering in the branches above our head. The bright rays of the sun were filtering through the green leaves leaving a geometrical pattern on the stone slabs. The path took us first past the grain storehouse which had been in use from the 4th to the 14th century. 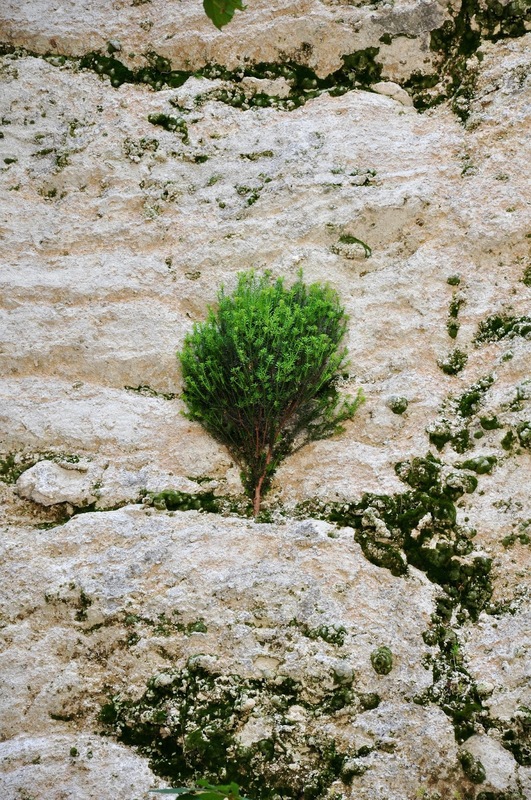 The people who had built their homes at the bottom of and up the cliffs would store grains, wine and cereals there. From the storehouse we continued up until we reached the caves and the rock church. 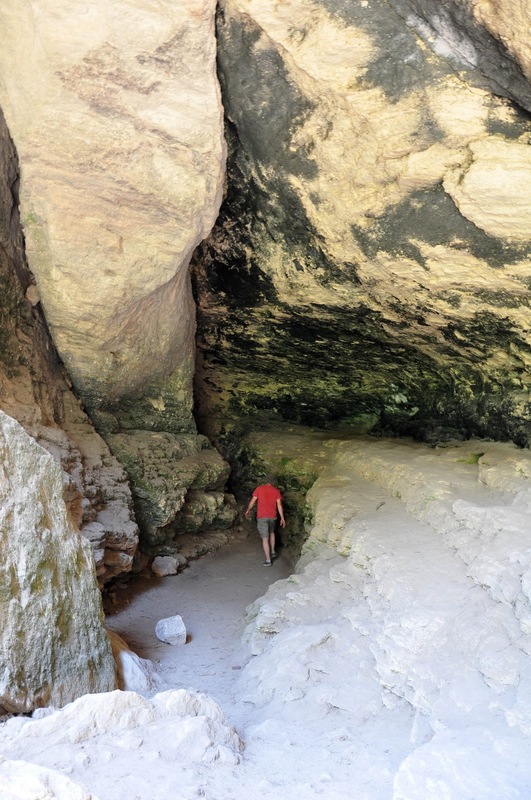 The Large Cave was really impressive and it reminded us of an open-air concert hall. Afterwards we found out that, indeed, it is used for musical performances in summer as it has incredible acoustics. In winter people told us that it gets covered with huge icicles looking just like a fairytale ice kingdom. 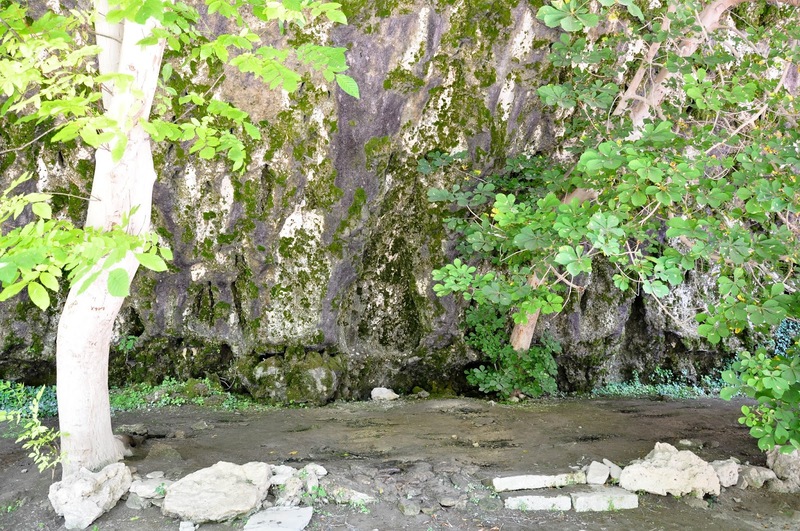 In the middle of the Large Cave a sanctuary dedicated to the Three Nymphs – Goddesses of the Forest, Nature and Water – had been discovered. 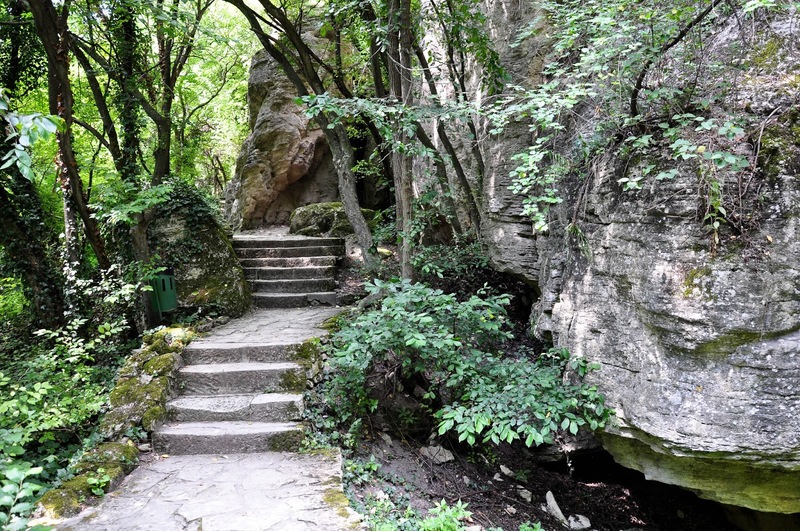 The rocks where it had once stood were covered with lush greenery, looking like the perfect bucolic place for a mythical creature to dwell there. An interesting detail caught our eyes. Square holes had been chiselled in the rocky walls of the caves at regular intervals. Apparently the ancient civilizations who lived there made them in order to insert the wooden beams onto which they would build their dwellings. Nowadays the wooden structures are long gone. 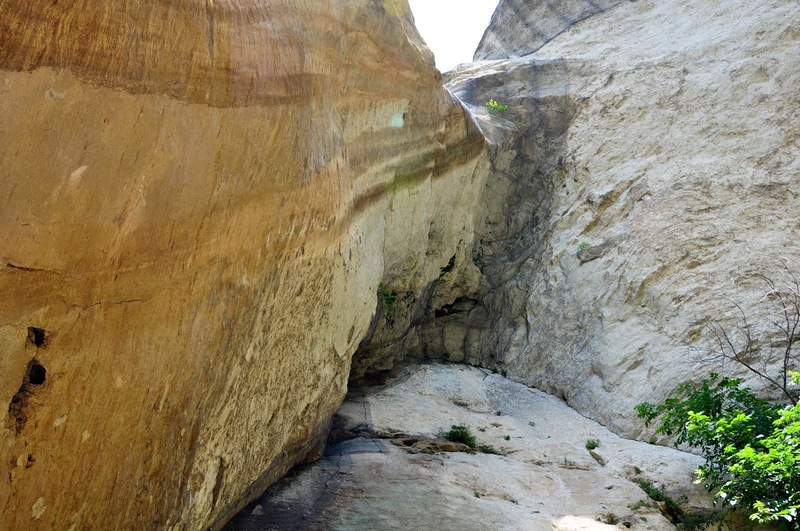 Only the deep grooves in the hard rocks indicate that once a lively settlement existed there. From the caves we followed the wide stone path all the way up to the Madara Horseman. We walked slowly, taking in the incredible views towards the cliffs on one side and the valley down below us. At one point a small naturally formed landing protruded all the way from the path over the forest below us. The panorama was majestic! A village lay in the valley. 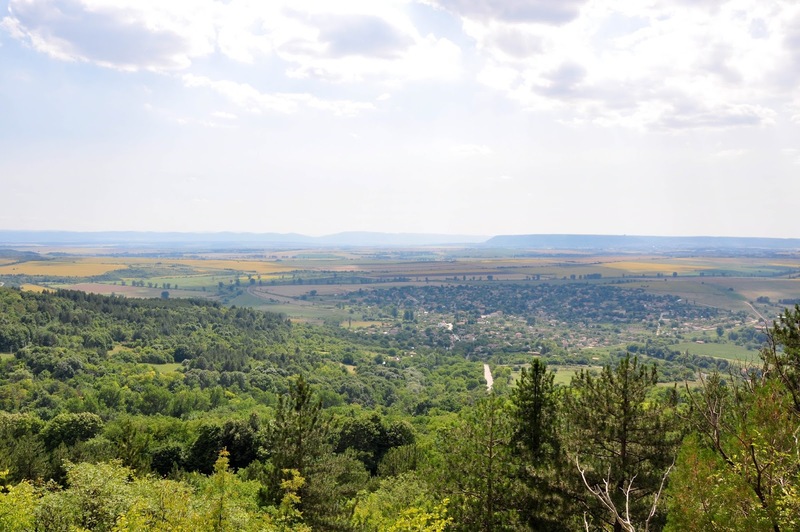 On the horizon stood the Shumen Plateau. We drank the view in. A few more steps up the cliffs and the path led us straight to the Horseman. We sat on a bench facing the rock relief and just spent a quiet moment taking it all in. It was an amazing feeling being there and seeing the symbol of Bulgaria. 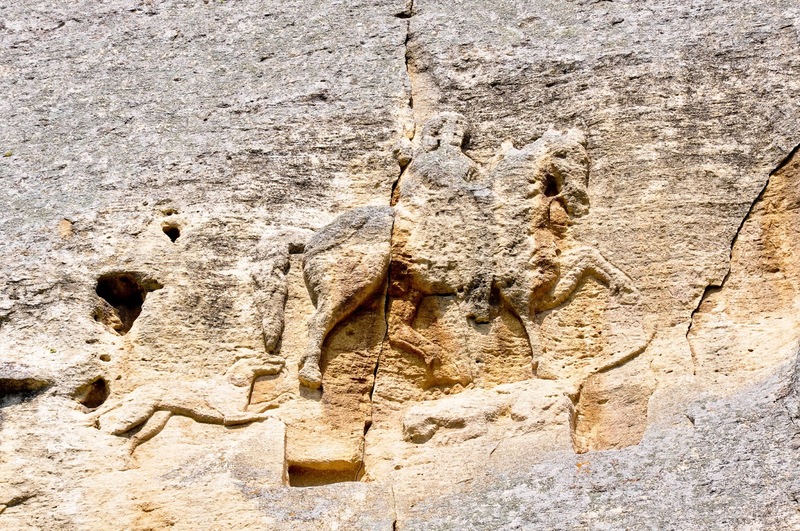 Carved to represent Khan Tervel – the second khan of the established in 681 Bulgarian state – it celebrates his military victories against the all powerful at the time Byzantium and the glory of his young country. 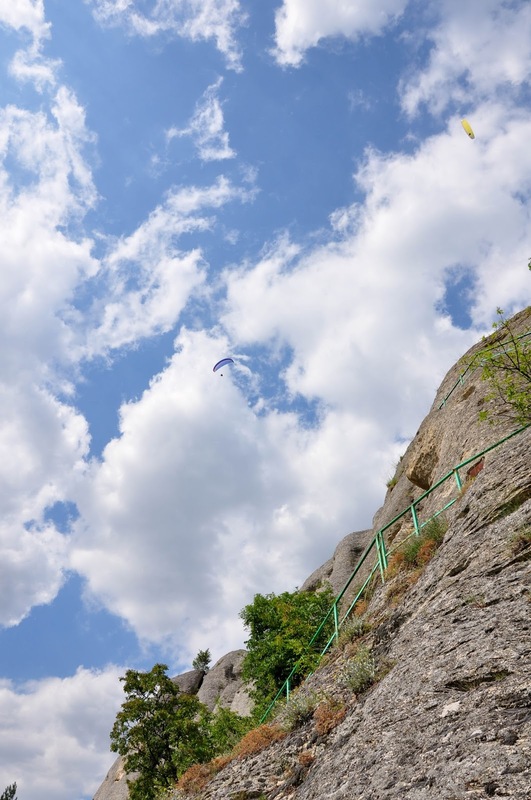 From there we decided to explore the Madara fortress – originally built in the 4th century right on top of the vertical cliffs. 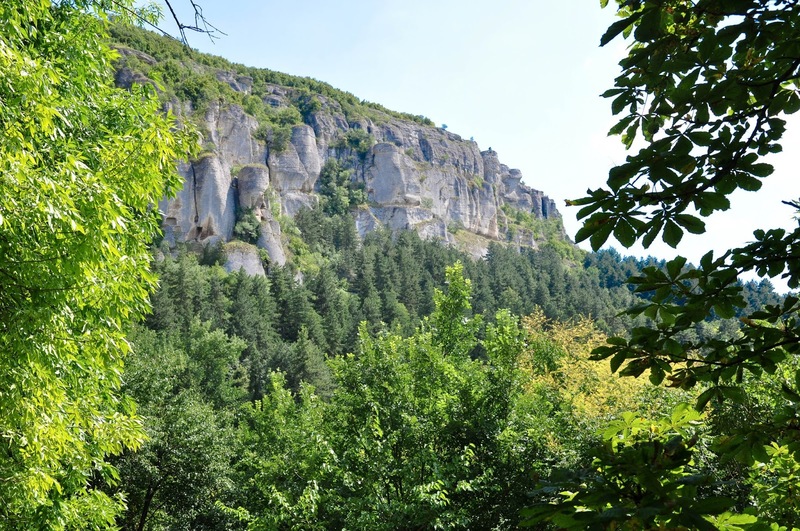 We followed the path, which from a gentle slope covered with flat stone slabs, suddenly turned into a wild forest track with uneven surface criss-crossed by the roots of the large trees on both of its sides. We walked for what felt like a mile up the face of the cliff until we reached a long string of uneven steps disappearing high up the rocky face. The view was amazing, but I felt quite intimidated by the climbing task ahead of us. Scaling the steps required comfortable shoes with a good grip and lack of fear of heights. I tried to overcome the panic which slowly started to brew in me. I tried to navigate the first dozen of steps just to give myself some courage. Two teenage boys ran past me taking the steps two at the time. Seeing them advancing rapidly up the 386 steps cut into the cliff itself I realised I really wasn’t up to the challenge. We had to go back with my tightly gripping the rails. We retraced our steps to the Madara Horseman, had one final look at its perfect symbology and I silently prayed to return one day rather sooner than later in order to explore this magical place in meticulous detail and attempt to scale the cliff all the way to the fortress on the top of it.